One of the most popular issues with runners and walkers is foot blister. For people who start running or walking, they have to do longer workouts. That’s why they are prone to foot blisters on your feet and toes. This problem is actually the result of friction or heat. However, there is a huge range of ways to prevent this condition. Let’s check out this article to learn how to prevent foot blisters. Your foot blisters are often caused by your shoes. Indeed, you can suffer from blister because of friction. The fact is that everyone comes with different feet in shape and size, so there is no shoe made to suit properly everyone. So, it’s important to choose the right shape and size to relieve blisters. If you wear a new pair of shoes when walking or running for a long time, it’s easy to get a blister. So, it’s best to take the last shoes. We advise you to walk or run for a short time with a new pair of shoes. Cramped shoes can cause blackened toenails after a long walk. Therefore, you need to look for shoes with the right width to provide enough room for your feet. If your insoles rub against your feet, think about changing styles of these insoles. There will occur some problems with blisters in your soft feet if you have a little tougher. If your feet take too much workout, it can cause calluses. They can work naturally as a pad to against the friction. So, it can prevent blisters. Many people need to toughen their feet such as long-distance walkers or marathoners. You can use about 10% tannic acid. Besides, you can also use a tea soak. You just need to apply it to your feet. It’s essential to do this twice a day for 3 weeks. In order to prevent dry calluses as well as painful cracks, you need to moisturize your feet. The ideal time is after your bath or shower. Use a high-quality foot cream. When it comes to the best socks for foot blisters, don’t choose cotton ones. Instead, you should wear synthetic socks. If you put on a pair of cotton socks, they can retain sweat in your feet. Actually synthetic socks can be able to keep your feet dry by wicking moisture away. It’s not difficult to find these socks at sports stores. It’s also a great idea to consider wearing double-layer socks. They can be able to not only reduce friction but also control moisture. So, they are great for preventing your foot blisters. There are many good considerations for you like the Wrightsocks. If possible, you should wear 2 pairs of socks at once. This is a good idea, especially for hikers. You need to pay attention to the thickness of the socks you are wearing. If they are so thick, you can’t give enough room for your toes. It’s time to consider a bigger shoe. Another method is wearing thinner socks. You may have to cost from $7-$20 for a pair of running socks. However, it’s best to choose a high-quality sock instead of a cheap one. Once you feel your feet become wet because of rain, it’s time to change your sock. This is really essential for marathoners. This way also can help to prevent them from getting foot blisters. The fact is that friction between your shoes, socks, and foot can create heat as well as tearing forces. Then, it leads to foot blisters. In order to reduce friction, you can lubricate your feet. There are some inexpensive lubricants on the market today such as generic petroleum jelly or Vaseline. If you are a marathon runner, it’s necessary to consider them on the course of your races. However, it’s hard to wash out of your socks. Even, you may get the dirt to your socks. This option is actually thicker compared to the petroleum jelly. However, it’s easy to find it in anywhere you can see baby diapers sold. 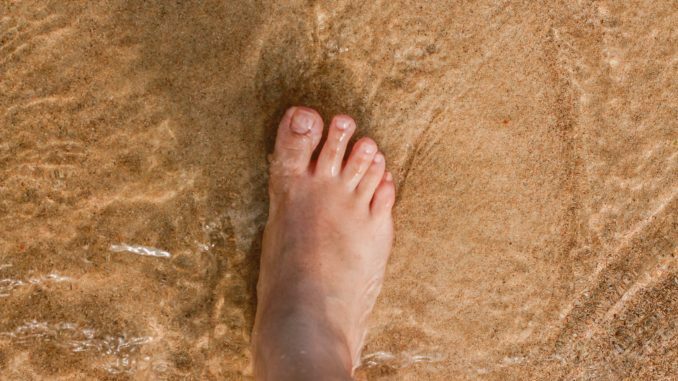 This is an affordable method to lubricate your feet. It’s easy to find them at running stores. These products are convenient to take with you. They are different in their formulations. You can consider applying these options during your workout. It’s a good idea. Also, they are used to against chafing of other body parts. When choosing socks, you will see some pairs coming with Teflon. This is effective in friction prevention. You can use talcum powder for this. Indeed, you only need to sprinkle talcum powder in your socks as well as shoes. This way can help to dry your feet effectively. It’s best to apply it at least 2 times for a long distance of moving. In fact, these powders smell nice. In fact, you can reduce your foot blisters by using an antiperspirant on your feet. Your blisters may be caused by getting dehydrated. That’s why you have to drink water during your run or walk if needed. Then, you can drink with electrolytes. By this way, you can get a balanced fluid. If you don’t know how to against foot blisters, this condition can prevent you from your tracks. So, it’s important to take your time to lubricate your feet before you start your long workouts. Remember to monitor your feet as well as all signs of hot spots. Most effectively, you should change your shoes and socks. It can help you to stay without foot blisters. Hopefully, our tips mentioned above are useful for you.